Initial consultations usually last up to 2 hours and all training is tailored to the owner's requirements. If you require specific training or your problem is in your home, then a private consultation may be required. Richard will train you and your dog in the environment where the behaviour is occurring, providing a greater understanding of how to train your dog. Written training instruction were necessary and email support are also included to assist your development. So you have gone through the process of deciding what dog you want and where you will buy it from, whether it is from a rescue centre or breeder etc. But what do you do when your dog is comes home? Sometimes accepting a dog into your home can be stressful and it is not always clear what you can do or who to turn to for advice. All the research and thought gone in to choosing your dog could all go too wrong, if the first vital few weeks are not structured to give your new arrivial the best possible start to their new life, no matter how old your dog is or where it's come from. Advice and training will be given, along with written training instructions and email support to successfully introduce your new dog to your home. 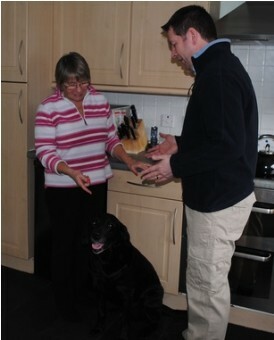 Including correct interaction between family members, structure, enrichment and general training. This is designed to help make your life, as well as your dog’s run smoothly and build a solid foundation to your relationship.